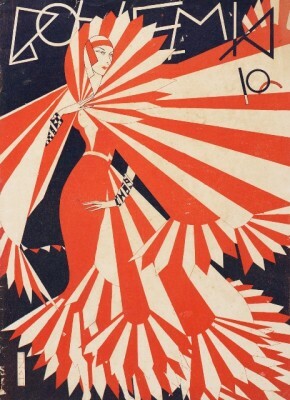 Magazine cover, "Bohemia," Nove. 24, 1929. Havana, Cuba. The Wolfsonian–FIU, Miami Beach, Fla. The Vicki Gold Levi Collection. This fall, The Wolfsonian-FIU continues its series of exhibitions at the university’s Modesto Maidique Campus with “La Habana Moderna,” currently on view at the Wolfsonian Teaching Gallery at The Patricia & Phillip Frost Art Museum. The small exhibition, on view through April 2011, examines how international cultural and commercial links contributed to the emergence of a modern identity for Havana in the decades leading up to the Cuban Revolution. Drawing from The Wolfsonian-FIU’s collection, the exhibition presents a number of episodes that reveal the influence of Havana’s international connections. It consists of a variety of media, including photographs, architectural drawings, posters, periodicals, record albums and advertising. Together, these items give visitors a glimpse into some of the complexity of cultural life in a city shaped by both its status as a cosmopolitan metropolis and its role as a vacation destination for Americans. La Habana Moderna is the second exhibition presented by The Wolfsonian-FIU with the Frost’s collaboration. Supported with funding from the Andrew W. Mellon Foundation, the Wolfsonian Teaching Gallery provides an opportunity for FIU faculty members to work with museum staff in developing exhibitions from the Wolfsonian collection that serve as resources for teaching and learning and advance scholarly research. For this exhibition, the museum collaborated with School of Architecture professor Marilys Nepomechie, who is using the exhibition to illustrate topics she discusses in class.